Let's add some complication. As a refresher: Homonyms are words that look the same, but have different meaning. Synonyms are different translations for the same word. The examples show you what you get for these cases. a.k.a. different translation, same meaning. 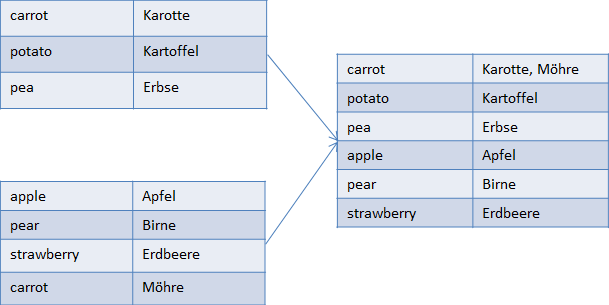 They are no problem, multiple translations from different termbases just get merged into one, like the two German words for carrot. a.k.a. same word - different meaning. As mentioned in the overview, these are also problematic. Again, the software does not understand anything, and if it sees the same word twice, it merges. You get too much merging. See Merging with a Master Termbase and Using a Field Instead of a Language for ways of improving the situation. In the example below, a lock in a door is not the same as a lock in a canal, but the terms get merged anyway.